The largest of European deer species, the red deer Cervus elaphus is found across most of Europe with each area having their respective sub species of red deer. Adult males, stags; can weigh in at 200kg, with the females, hinds; weighing in at a slightly more modest maximum of 120kg. The impressive antler rack of a red stag can reach a spread of 34 inches, with 16 or more ‘points’ or tines. 12 ‘pointers’ (6 points per antler) are known as Royal Stags, 14 points an Imperial Stag and a mighty 16 or more known as a Monarch Stag. With their dark red coat and huge, majestic branching antlers, red deer stags are a popular species for trophy hunters. Iberian red deer, Cervus elaphus hispanicus, are slightly smaller in size to their Scottish counterparts but no less impressive. Unique to Spain and Portugal, the Iberian red deer lacks the full mane of the Scottish reds, but with a smoother, paler coat making them ideal trophy mounts. Antlers are frequently more elaborate, albeit not as heavy or branched as the British reds – something truly unique and combined with the unforgettable experience of the Iberian hunt across the stunning, rolling Portuguese countryside through the lavender, olive groves and challenging rock-strewn hillsides. Bronze, silver and gold medal animals are regularly taken on our stalking grounds in Portugal, making for a memorable Iberian trophy hunt. For those less interested in a trophy animal, cull hunts are also available to manage and maintain the health and population of the herd. 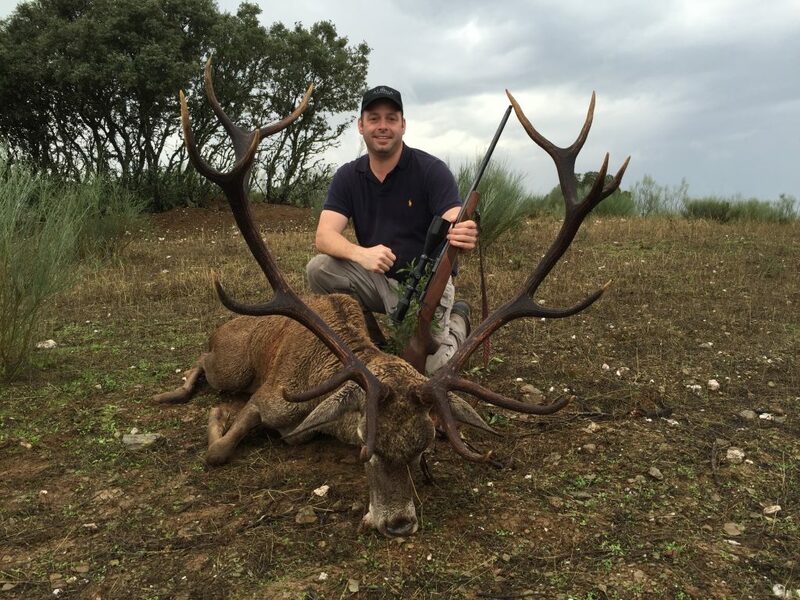 Portuguese red stag hunts are offered – in a much more agreeable climate compared to the Scottish stag hunts – during the rut from mid-August to the end of September each year on our grounds close to the Spanish border. Hunts take place in a variety of terrain, testing the stalkers skill and fitness as we stalk free roaming quarry across a careful selection of old estancias, farmland, lush rolling olive groves and up on to the stunning, rugged Iberian serras, all whilst drenched in the beautiful Mediterranean sunshine. Currently, we have available 3 days hunting and 4 days accommodation in Portugal hunting red stags – with management beasts available in addition to 12 to 18 point trophy beasts. The cost for the 4 nights is £3000, which includes 1 12-14 point animal, with the option to upgrade this to a 16-18 point animal for an additional £1000. Transport, firearms permits and trophy preparation can also be arranged if you require.